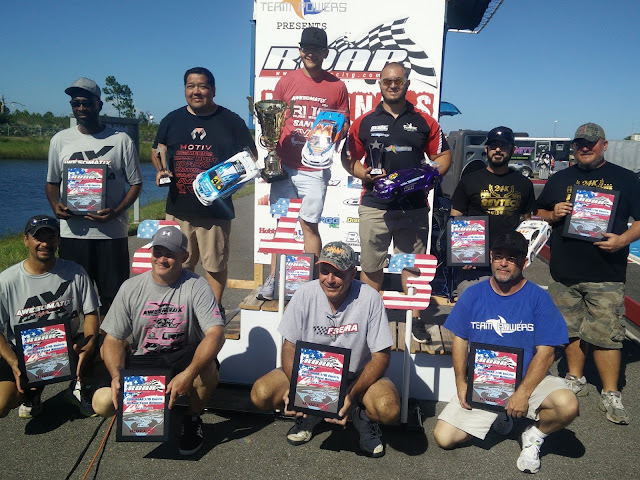 This past weekend RC racers from around the USA and Canada converged at Valkaria RC to race against the best at the 2016 Roar Asphalt Nationals sponsored by Team Powers. 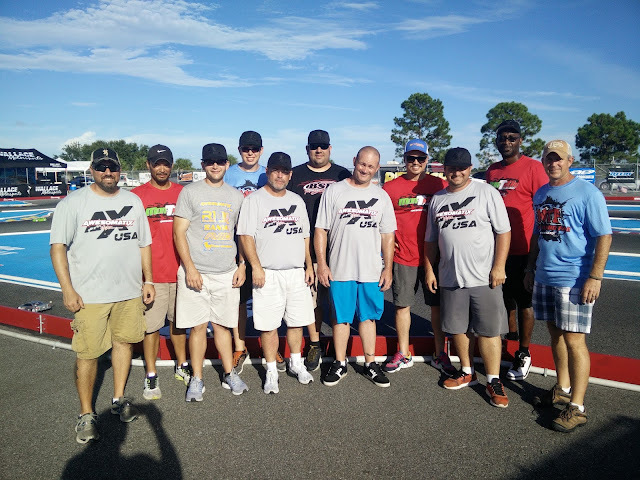 In attendance for Team Awesomatix USA was Mike Gee, Mike Hanulec, Monti Panzica, Sam Isaacs, Danny Jenkins, Chris Kemper, Billy Spence, Sal Amato, Tim Haskins, Jason Burks, and Johnee Fenimore. Having never won a ROAR National Title on Asphalt, the Awesomatix team had high hopes to make the 2016 Paved Nationals their best and most productive yet. 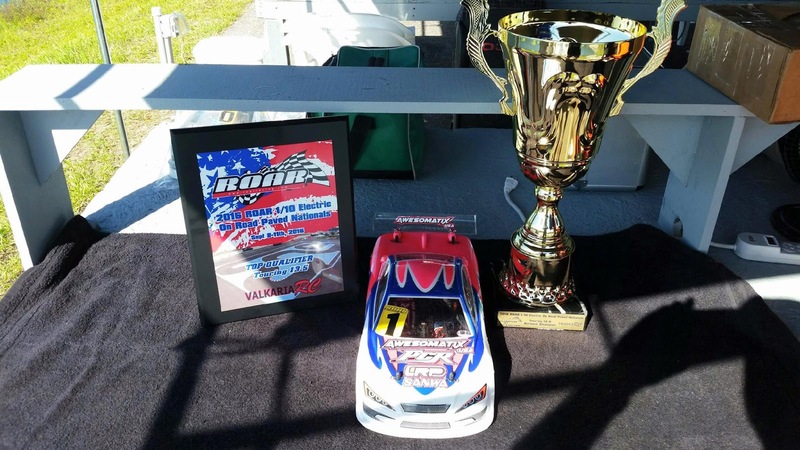 Practice began on Wednesday morning as drivers quickly became aware of the ever-changing track conditions and intricacies of the beautiful Valkaria RC layout. As practice continued through Thursday night, it was Mike Gee looking strong in 13.5 as well as Mod TC. 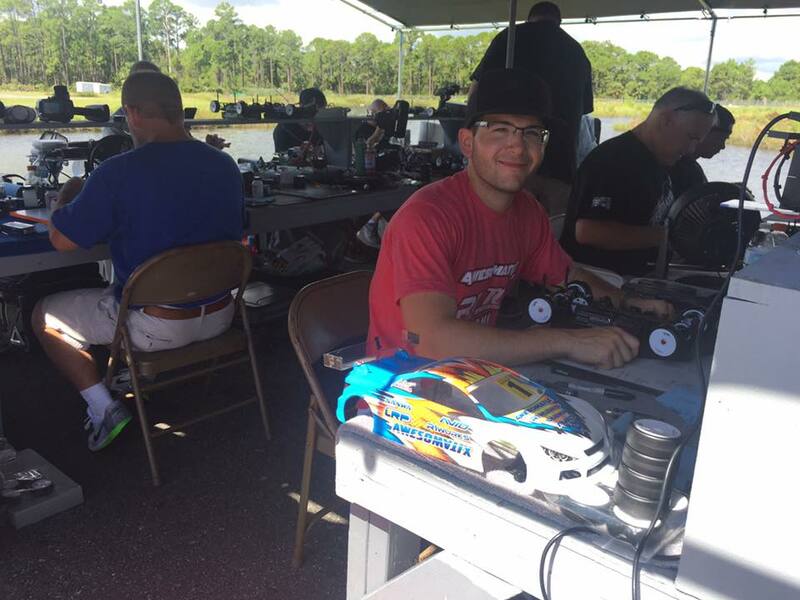 Sam led the way as “practice TQ” in 17.5 TC with the rest of the team finding strong pace as well. 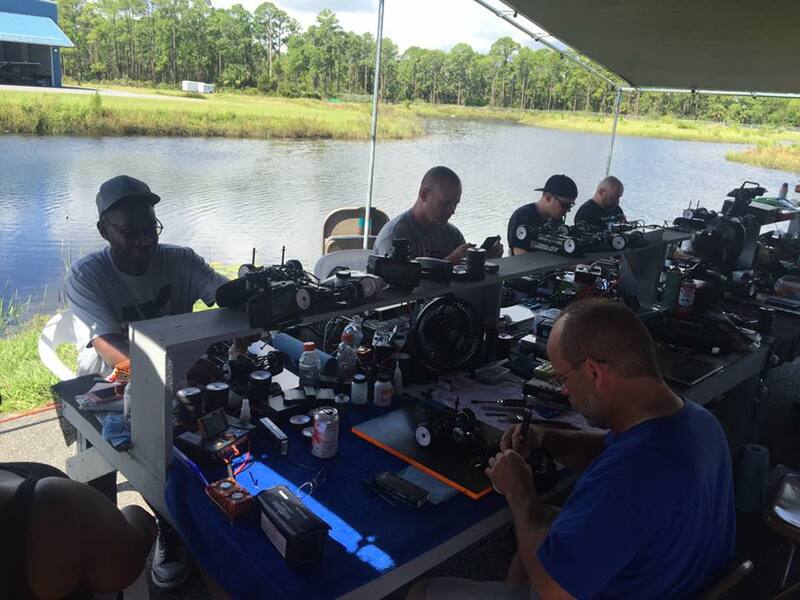 Johnee Fenimore appeared to have the 21.5 TC class locked down. Qualifying began Friday night, with qualifying points being used to determine main starting positions. 21.5 TC was led by Johnee Fenimore who TQ’d 3 of 4 rounds to start on pole. Tim Haskins also made the final to start 3 cars in the 21.5 main event. 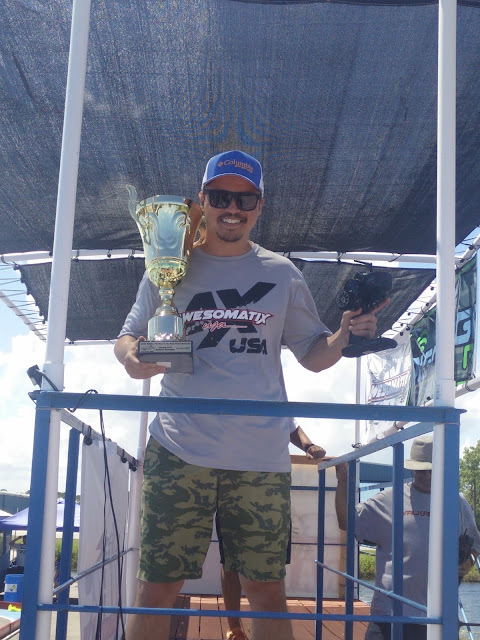 Johnee won A1 and A2 to become the 21.5 TC National Champion! 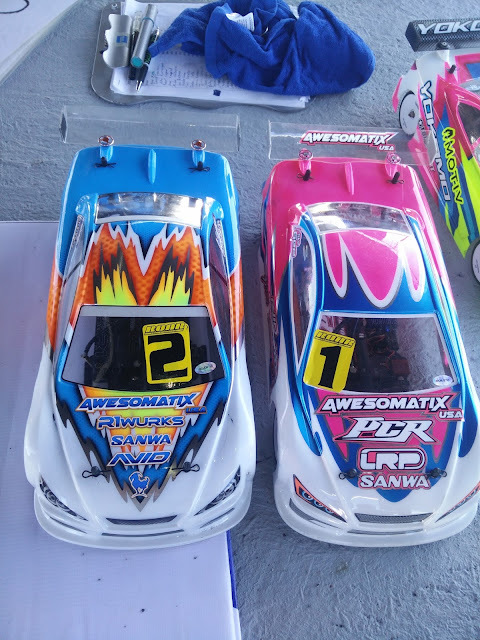 In 17.5 touring, the largest class, Sam was able to TQ 3 of 4 rounds and start on pole for Sunday’s main event. 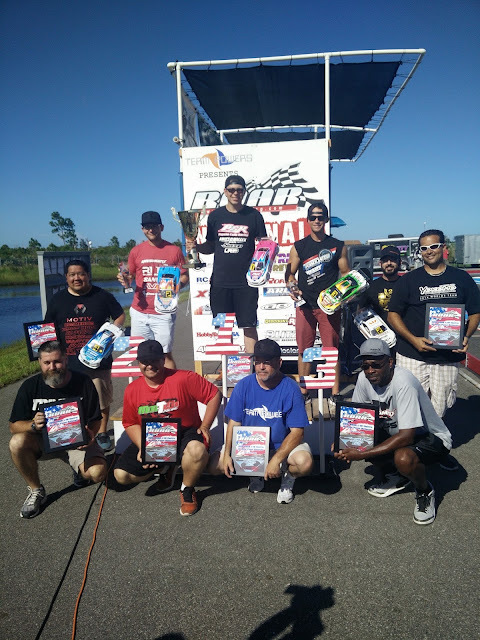 Chris Kemper, Danny Jenkins, Billy Spence, and Sal Amato all made the A final for a total of 5 Awesomatix cars. Sam won A1 in convincing fashion over 2 seconds clear of the field. 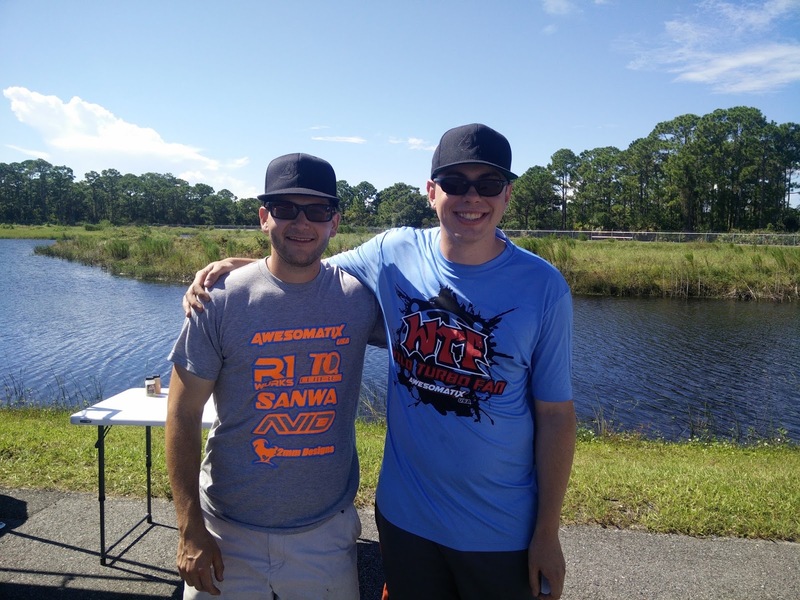 A charging Ray Darroch, Austin Wolfe, and Craig Xavier who started 2nd, 3rd, and 4th respectively made Sam’s work harder in A2. An early rough start for Sam put Craig and Austin to the top early. 3 minutes in, Austin flipped on a dot and Sam got around, slowly catching Craig for the race lead. 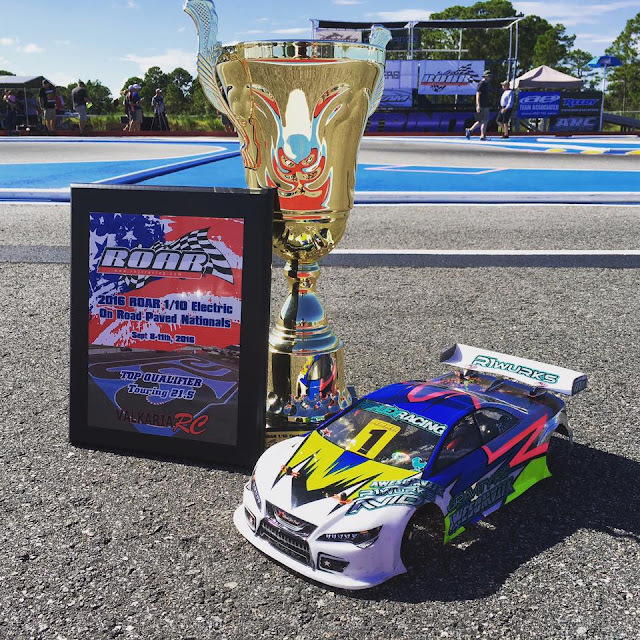 With two laps to go, Sam made a clean pass on the inside of Xavier in front of the driver stand just before the chicane, and came around for his final lap to take the overall win and title in the 17.5 division! 13.5 touring was the Mike Gee show, as he TQ’d all 4 rounds of qualifying in strong and convincing fashion, with teammate Sam Isaacs finishing with three 2nd’s to ultimately lineup second on the grid. 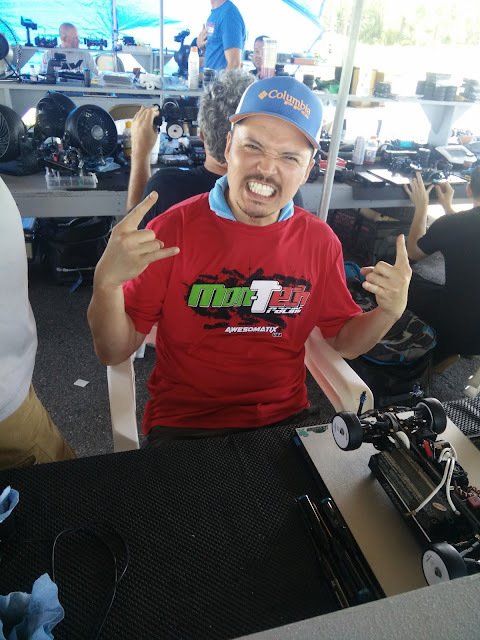 Team Associated’s Keven Hebert would line up third with Xray’s Craig Xavier in the 4th spot in what would surely be a fun and competitive set of A main finals. Danny Jenkins, Chris Kemper, and Mike Hanulec also made A-main appearances for a total of 5 cars in the A. Mike Gee led tone-to-tone in A1 and A2 to claim his 5th National Title, with Sam Isaacs winning A3 to secure second place over Associated’ Keven Hebert and Craig Xavier in 4th. 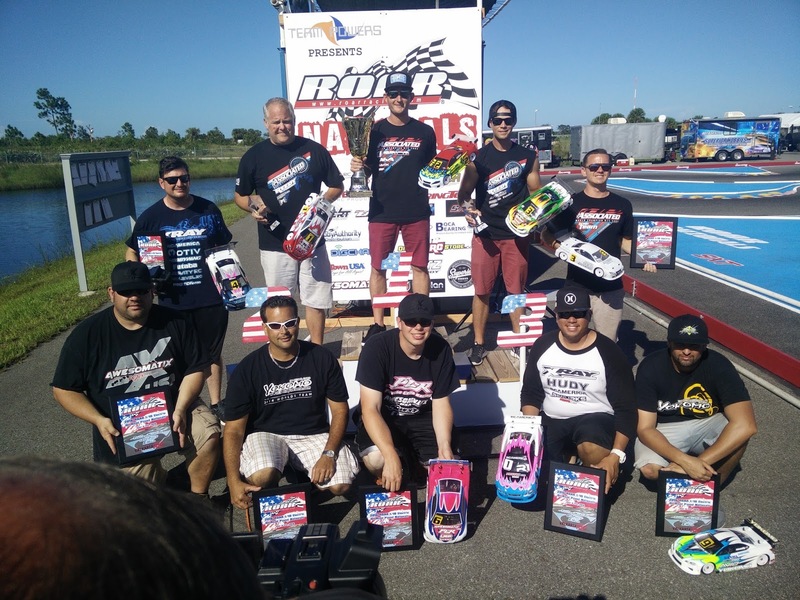 As expected, Modified TC proved the most entertaining and talent-packed class of the event, with several ROAR national and IFMAR world champions present. Among those entered were Ryan Cavalieri, Rick Hohwart, Keven Hebert, Randy Caster, and Paul Lemieux, making this the most stacked Nationals in recent memory. 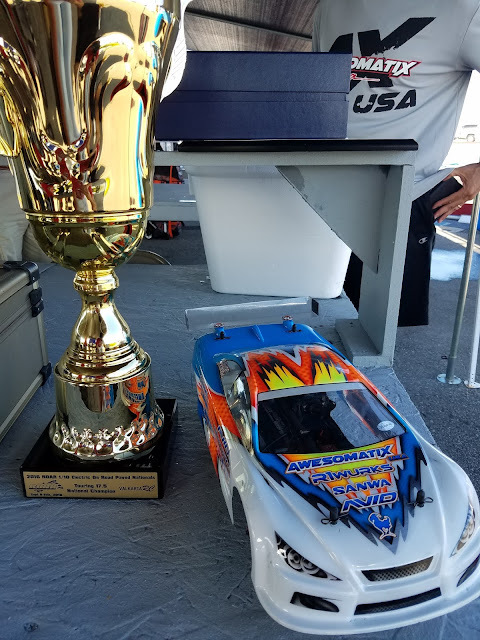 Awesomatix USA was well represented in Modified TC as Mike Gee, Mike Hanulec, and Monti Panzica all looked to do damage. Mike Gee highlighted qualifying as he lead for 3 minutes over 4 time IFMAR world champion Ryan Cavalieri in round 2, suffering an unfortunately roll over from which he recovered to take his best single round finish of 5th. After 4 rounds, Gee would start 6th with Panzica making the A final starting 10th after an excellent third and fourth round. As the mains began, Rick Hohwart started on pole with Cavalieri, Caster and Lemieux in tow in what was an epic three-leg set. Hohwart displayed perfect driving in A1 but fell victim to “Associated on Associated” crime when Cavalieri hit him from behind and went on to take the A1 win. Hohwart’s driving clinic in A2 led him to a win but a mistake in A3 gave the overall title to Cavalieri. Mike Gee placed best for Awesomatix, finishing 7th overall as Monti Panzica would round out the A-main in 10th. Awesomatix USA finishes with its best asphalt results to date, taking three National titles to sweep the spec classes at the 2016 Roar Asphalt Nationals! The team showed great pace, support and teamwork all week to help the team reach the top! Come catch up with the team next month in Las Vegas at the International Indoor Championships! The silver AM06 was the very first hub on offer for the A700 line of cars. This part was available through the first generation of A700 kits. As of 2016 this part is no longer being manufacture, but is available in limited quantities. With the introduction of the second generation of cars, a lower height hub, AM06S, was now on offer. The switch from AM06 to AM06S needs 2.5mm correction ( reducing) of the inner upper shims for equal roll centers. Soon into the Awesomatix USA product line offering we made the AM06S a standard part within our 'USA Spec' car kits. By April 2014, AM06S became the standard for all Awesomatix cars. As of 2016, this hub is no longer being manufactured. The third hub, AM06M, started life off as a modified AM06 hub with the lower section cut to offer the same axle height/roll center as the AM06S, but with a narrower track width (1.5mm narrower on car width). This hub became very popular on the rear of our A700 Evo and Evo2 cars when racing on asphalt. In July 2015 the AM06S-M were introduced. This part had the the geometry of AM06S with additional flex and possibility of bearings fit adjustment via additional M2 screws. AM06S-M became the standard hub with the A800 chassis. These hubs seemed to work best within the new vehicle dynamics of the A800 with a 1mm shim at the bottom of the hub. AM06S-M is no longer being manufactured. In response to the 1mm shimming of AM06S-M, the AM06W have been introduced. Both of these hubs look very similar. To tell them apart, look at the height of the 'tubes' on the top of the hub where it mates w/ the AM14 part. On the AM06W you'll find a recessed tube.